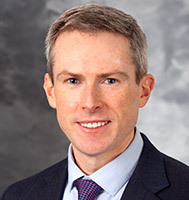 Dr. Daniel O'Connell earned his medical degree from The Ohio State University College of Medicine, Columbus, OH. He completed a combined internal medicine and pediatrics residency at University of Michigan, Ann Arbor, MI, and served as pediatric chief resident at the University of Michigan after residency. His fellowship in pediatric gastroenterology was at the Ann & Robert H. Lurie Children's Hospital, Chicago, IL. He is an Assistant Professor of Pediatrics at the University of Wisconsin School of Medicine and Public Health and at UW Health American Family Children's Hospital. He is board certified in pediatrics, internal medicine and pediatric gastroenterology. His clinical practice includes general gastroenterology and hepatology, with special interests in inflammatory bowel disease, celiac disease and nutritional interventions for common GI illnesses.